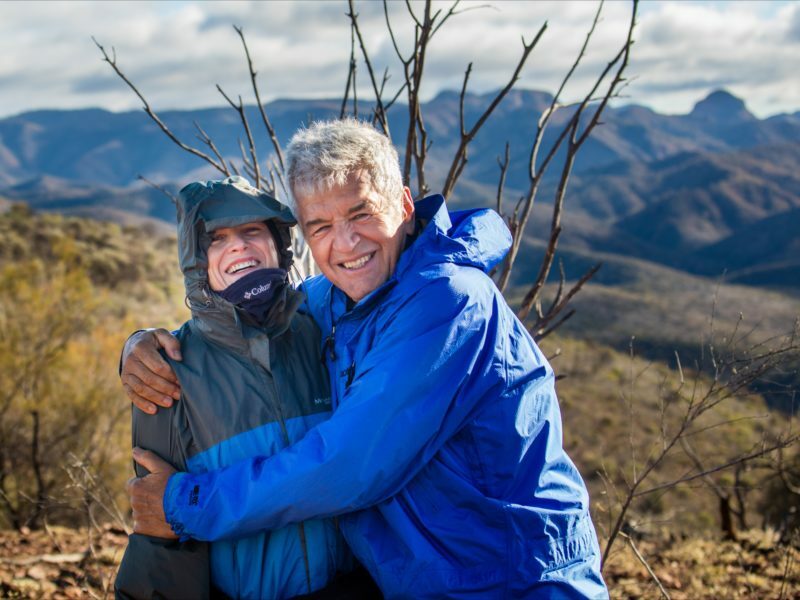 From the mountains and rainforests of the Scenic Rim to the beauty of Tasmania, interNATIONAL PARKtours (IPT) takes you on small group walking tours to national parks and natural regions around Australia. Discover the country on easy to medium grade walks. Travel between destinations by private coach. Relax and unwind at the end of the day in comfortable accommodation. Most meals are included with the focus on local cuisine and regional produce. IPT guides are experienced and have your comfort and energy levels in mind. Australian walking holidays range from three to four day short breaks, one week hiking tours or extended walking tours of two to three weeks, which travel to more remote areas. IPT also organise special interest tours including birding, wildlife, food/wine and art-based adventures. interNATIONAL PARKtours have operated walking focused tours in Australia and around the world since 1975. The company is family-owned and the office is located in Australia’s Gold Coast hinterland (near Lamington National Park). Make a pilgrimage to the heart of the Gondwana rainforests on one of Queensland’s long distance hiking trails. Spend five days walking this 54 kilometre trail with the comfort of luggage transfers and walking only with a day pack. Traverse the mountains, World Heritage listed rainforest and hidden valleys of Lamington and Springbrook National Parks. This fully accommodated tour includes options at two of Lamington’s iconic lodges and chalet accommodation on Springbrook. From O’Reillys Rainforest Retreat, walk 21 kilometres through the Green Mountain section of Lamington following sections of the Queensland/New South Wales border. 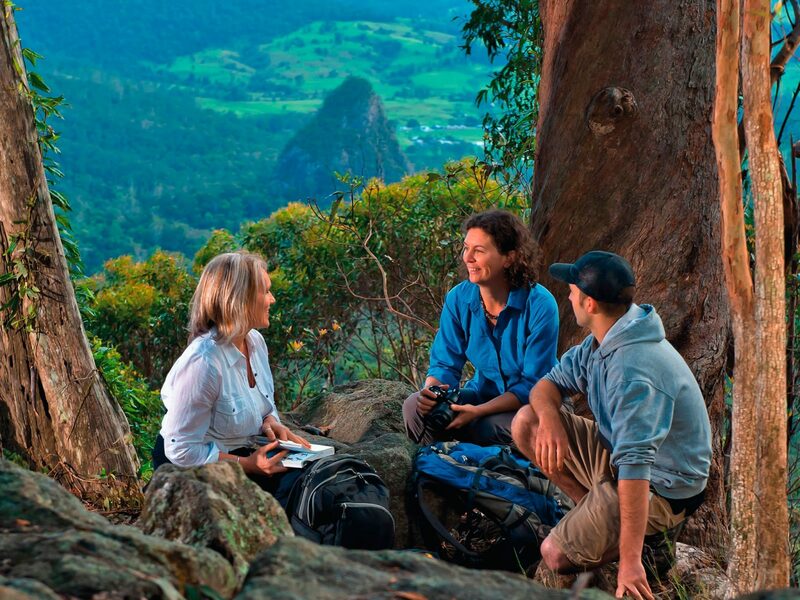 Based at Binna Burra Lodge, explore the Lower Bellbird Circuit with lookouts over the eastern side of Lamington National Park. Admire the stands of flooded gums, brushbox and piccabeen groves on the way to lunch at the base of Ballanjui Falls. Leaving Lamington plateau, descend past Egg Rock, a remnant plug from the Tweed shield volcano, Wollumbin (Mt Warning). 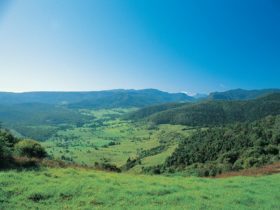 The trail continues through the farming valley of Numinbah, then climbs steadily to the mountain plateau of Springbrook. Staying overnight in chalet accommodation, a highlight is a half day hike via Warringah Pools to the cool spray of Purlingbrook Falls in Springbrook National Park. Treat yourself with a short break in the Scenic Rim and learn its secrets from the locals. Stretching south west of Brisbane, this arc of sweeping ranges, river valleys, lush rain forests and quaint country towns is the perfect city antidote. Walk amongst spectacular land forms, sample fresh produce and meet artists and local characters along the way. 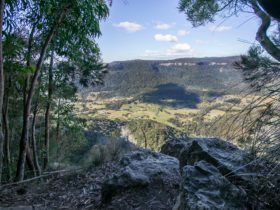 Travelling from Brisbane via the country towns of Kalbar and Harrisville, we begin with easy walks in Moogerah Peaks National Park. 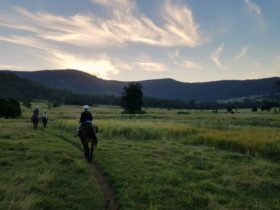 In and around the lively town of Boonah, enjoy the combination of good food, wine, local art, along with gentle walks in Main Range National Park. A lunchtime cooking class, contrasts with creek walks and mountain lookouts in the Mt Barney area. Travelling via Rathdowney and Tamrookum, we then explore the eastern side of the Scenic Rim. Based for two nights at Tamborine Mountain, short walks lead to palm forests, waterfalls and quiet lookouts. We enjoy the mountain’s culinary delights and meet local characters. 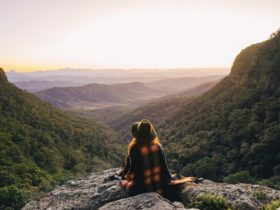 Our final day includes a short walk in Lamington National Park, time at a Beechmont art studio and lunch with views back over the mountains before returning to Brisbane. Explore south east Queensland at one of our favorite times of the year. Spring in the mountains heralds clear skies, wildflowers, comfortable walking days and cool nights radiant with stars. 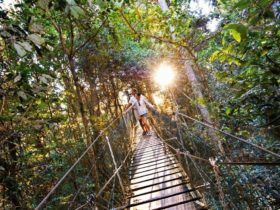 Walks include creek explorations, exhilarating ascents of the local peaks and shorter strolls through sub-tropical rain forest in World Heritage listed areas. From Brisbane we travel south west to Main Range National Park for rain forest walks. This park straddles the Great Dividing Range and is part of the Scenic Rim arc of mountains. South of Stanthorpe we spend two full days exploring Girraween National Park. Meaning “Place of Flowers”, Girraween National Park is famous for its granite domes, improbable balancing boulders and exquisite water worn creek formations. Spring blooms include golden wattle, pea flowers, orchids and native bluebells. Moving east, we spend two nights at Mt Barney Lodge beneath the dramatic massif of southern Queensland’s highest mountain. Mt Barney National Park protects many rare and restricted plant species, especially on the higher peaks. Enjoy hikes through open eucalyptus forest to creeks with shallow cascades and deep pools, home to platypus and kingfishers, honey eaters and robins. The world’s largest stand of Bunya pines, the vast Queensland sandstone wilderness, the rainforests of Eungella and the sparkling Whitsunday Islands all feature on this 13 day journey. Three hours from Brisbane we enjoy a short stop in the pristine Bunya Mountains, an isolated section of the Great Dividing Range. 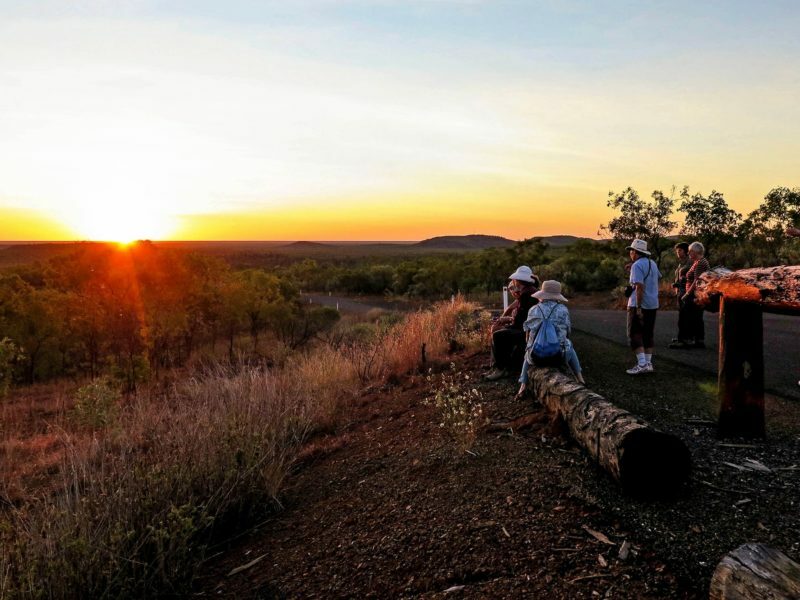 To the North West, we settle into the Carnarvon Gorge Wilderness Lodge and explore Carnarvon National Park. Half and full day walks awaken the senses, as we discover the wealth of cultural and natural treasures of this very special park. Walk up the main gorge beside Carnarvon Creek to well-preserved Aboriginal rock engravings and ochre stencils. Take in birdlife at seasonal Lake Nuga Nuga. Award winning museums, creative boardwalks, and botanical gardens await us in Mackay, Queensland’s largest sugar producing region. From our base at Broken River explore the mist-shrouded and forest-clad mountain refuge of Eungella National Park, one of Queensland’s most ecologically diverse parks. 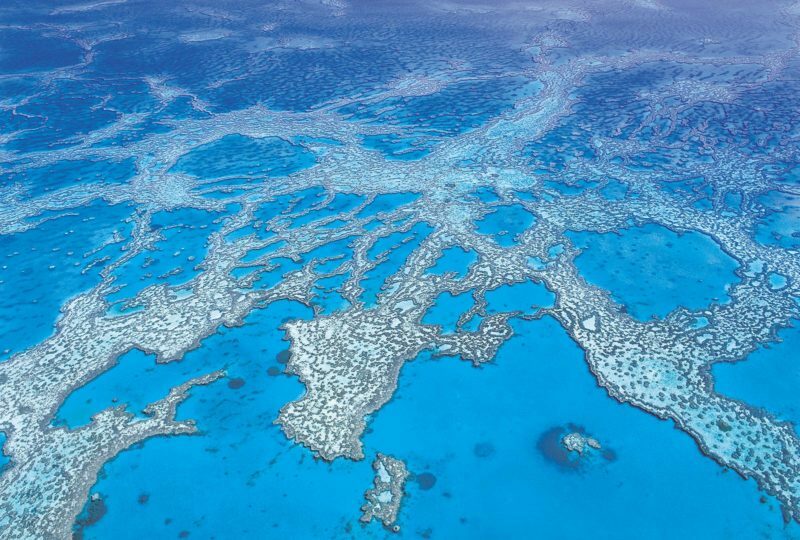 Their journey ends in the tropical warmth of the Whitsunday Islands, with walks through Conway National Park and a cruise to an idyllic island, offering a chance to see majestic humpback whales and migratory birdlife.